You may have seen him. 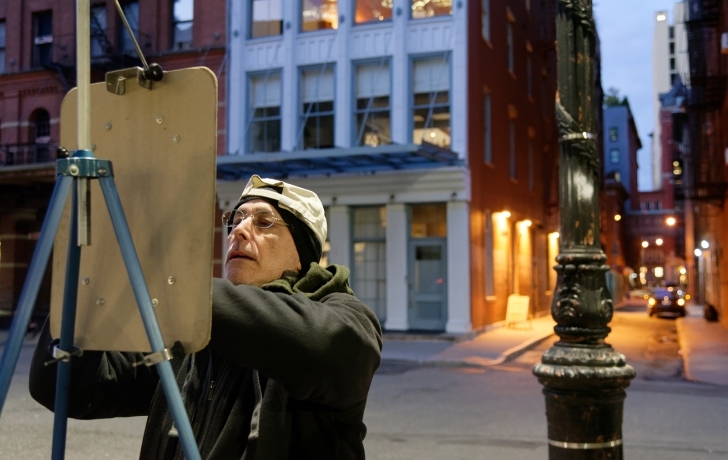 Standing beneath the glow of a street lamp near one of Tribeca’s timeless alleyways, the painter stands for hours, applying tiny brush strokes to the nocturnal scene on his canvas. His name is Liam—he gives no last name—and he has been painting in the neighborhood for years. On a recent chilly evening he had come to work outside Duane Park, with a view up Staple Street, his subject. First donning multiple layers of sweatshirts and a couple of caps, he laid out oil paints on a portable easel. Painting with his back to Staple Street, he turns around to briefly study the lonely streetscape, then paints from memory. It is a street scene that countless photographers and painters have captured. But Liam’s near photo-realistic interpretation, bathed in a luminescent reddish cast, feels fresh. Two paintings of Staple Street plus one of Cortlandt Alley and the back alley off Franklin Place, will go on view for five evenings, Tuesday Nov. 6 to Friday, Nov. 9, from 6 to 9 p.m. The venue, as unconventional as the painter himself, is SYNLawn, at 59 Franklin St. a store that sells artificial grass. For the past 10 years or so, Liam said, he has been painting below Canal Street, though his sketches of the neighborhood go back to the 1970s. There was a time, he said, when he worked from rooftops and out of windows. But those aeries became less accessible. “Then, I started getting more to the ground and more into closed spaces,” he said. And going out later, too. During the summer, he will start setting up at 8 p.m. and paint until 1 in the morning. He stops when the weather gets so cold that his hands shake. Liam keeps much about himself to himself. He lives “uptown.” His age? “The whole thing is people evaluate,” he said. “They put you in a box.” His past? He shrugs and says it doesn’t matter. What matters, he said, is the work and how it connects him to people, those who stop long enough to say hello, maybe offer something to drink, and appreciate his painting. “Hey, Scott!” Liam called out. No one in the neighborhood looks after Liam like Anastasia Phillips and Hussein Habeeb, co-owners SYNLawn. They got acquainted with Liam when he was painting Franklin Place, near the store, some four or five years ago. “They adopted me,” Liam said. In time, there were philosophical discussions about art and the art world, and appreciation for Liam’s work (“I saw the magnitude of the depth of his vision,” Phillips said) that has led to an ever closer relationship, and now the showing of his paintings. Liam has a key to the store, and he can come and go as he likes. Importantly, he can store his paraphernalia there and avoid hauling it on the subway.